This recipe is one to celebrate the change in season. 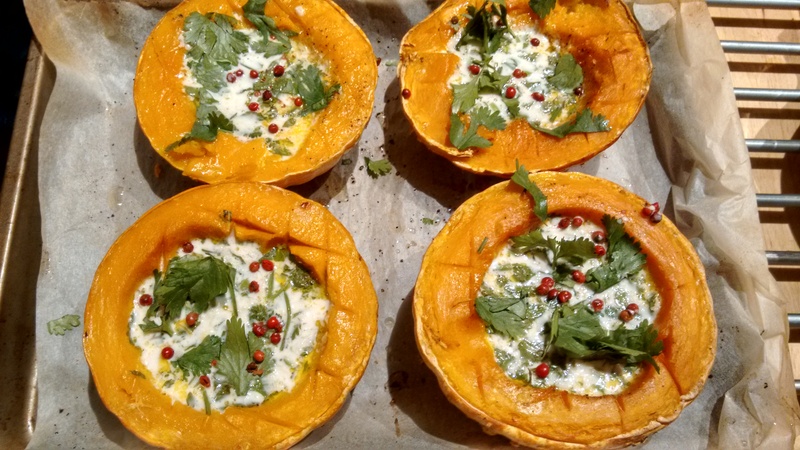 We are combining the new warm colours and comforting flavours of Autumn cooking with the lovely bright flesh of the squash but zinging things up with a fresh, summery filling of coconut, ginger, lime and coriander. This is possibly the easiest meal ever, once you’ve chopped your squash in half! Let the oven do the work and enjoy the wait! 2. Cut squash in half and remove seeds. Score the flesh with a knife in a criss-cross fashion and drizzle with a little oil and sprinkle with salt and pepper. 4. Meanwhile mix together the filling ingredients, except the peppercorns, adding as much lime to suit your taste. 5. When the squash are cooked carefully spoon in the coconut mixture – any extra sauce can be added as you eat. 6. Sprinkle a few pink peppercorns and pop back into the oven uncovered for about 10 mins until heated through . That’s it! Ready to serve with some green salad for an easy and tasty meal.